Sometimes you want a dessert just because of the idea of it. This is one of those puddings: golden eggy bread, tart raspberries, rich cream …Irresistible. If you can’t get your hands on brioche – the sweet French bread – any good white bread will do as long as it has a soft crust. Whisk the cream and eggs together with the sugar. Either leave the brioche slices whole or cut them in half (a stack of four halves can look very good). Dunk the first two slices of brioche in the egg mix and leave for 5 minutes. Melt a knob of the butter in a frying pan and cook the brioche slices, a couple at a time, adding more butter as you need to, until golden on each side. You need to dunk the next slices of brioche in the egg mixture as you go along. Put each slice on a paper towel as it is cooked. 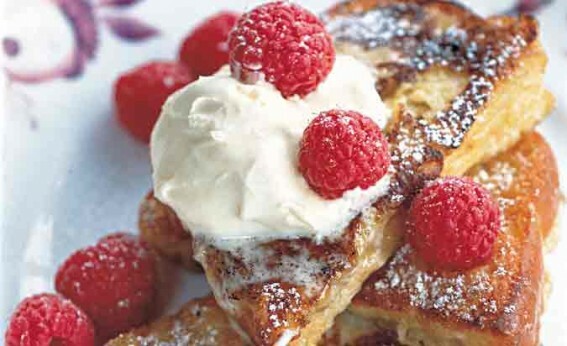 Serve two slices of brioche per person, sift with icing sugar, and add the raspberries and clotted cream.